5 Ways We Are Making Work Fun at LinkNow Media! ‹ LinkNow Media | We're Hiring! Who decided that work couldn’t be fun, anyway? Here at LinkNow Media, we make it our mission to shatter that old stereotype—every single day! 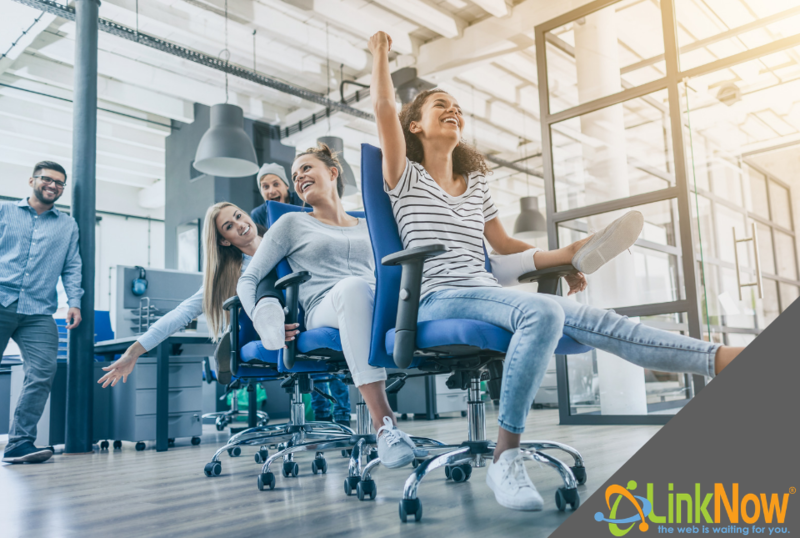 That’s because we know that a fun workplace is a productive, energetic, and successful workplace. When you mix in humour and camaraderie, even the most challenging tasks can be enjoyable. Finding that perfect blend of hard work and amusement is the recipe for a perfect professional environment. That’s why our team looks forward to showing up every day. We’ve put together this list of five of the many reasons LinkNow is making work more fun than ever! LinkNow Media rewards the awesome work of our team players with equally awesome cash bonuses! However, these definitely aren’t your average bonuses. When our workers meet their quotas, instead of just being handed a boring old bill, they get to come on up to the wheel and spin for amazing cash prizes! We’ve also got Plinko, Jenga, and a bean bag toss. The whole company gets in on the fun, applauding and congratulating the big winners! Games and cash bonuses…what could make work more fun than that? Every day is a special day at LinkNow—however, some days are extra special! Whether it’s a barbecue, holiday gathering, talent show, costume party, or a special milestone, there is something to look forward to all year long. When it’s time to celebrate, we really go all out! Here at LinkNow, our team has even more reasons to look forward to break time. Our workers gather around our beautiful cafeteria, catching up over our free coffee, fruit, and breakfast items. For even more fun, we have ping-pong and foosball tables, arcade machines and even an Xbox. With breaks like these, it’s no wonder we return to work feeling so refreshed and productive! Offering a bright, energetic workplace is very important to us at LinkNow—after all, we spend a lot of time here. We believe that a working environment doesn’t have to be stiff and formal to be considered professional. Our casual dress-code encourages the creativity and individuality of our staff. Walking through our offices, you’ll notice an awesome variety of colours and styles in our employees’ attire. At LinkNow, conformity is a thing of the past! This atmosphere is enhanced by feel-good, energizing music which is bumping from 9 to 5. Our workers enjoy personalizing their workspaces as well! Our desks and offices display an eclectic range of décor. Photos, cartoons, joke-of-the-day calendars, stuffed animals, plants…you never know quite what you’ll see. We’re extremely proud to have such warm, approachable team members at LinkNow. Effective communication between departments is an amazing aspect of our business and a huge part of our success. We know we can count on each other for feedback, advice, and answers to our questions. Of course, this also means lots of jokes and laughs shared. The result is a stronger, more engaged, and better-connected team. If that isn’t the recipe for success, we’re not sure what is!